9:30am - Last nite at bedtime, I posted in my little note pad, "Take Scampy out on a trip!" Putting something down in writing seems to be a way to get it done. Who knows where we are going? We have not decided. But wherever we go, we will be out and about. And that's a very good thing! In Yiddish, "Zaida" means grandfather. 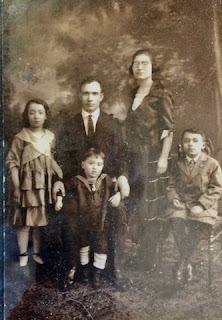 In 1912, several months before my Mother was born, my Zaida left where he lived in what was known as Kishinev, Russia. He left his family behind until he earned enough the following year to bring them also to America. Zaida made his way thru Romania, Hungary and Poland. Then thru Germany to the port at Bremen. Then by ship to America. Then to Cleveland where our relatives lived. If my Zaida had not made the decision to move his family to America, there is little doubt that 25+ years later, I would have been caught up in the nazi murdering of Jews. All over the World, hatred of and persecution of Jewish people is happening. With increasing frequency. During the time of the nazis, what nazis were doing to the Jews was not responded to. That ignoring of the threat to Jewish people cannot happen again. Jews are the victims here. Not the cause of the hatred and persecution against them. From where does this hatred and persecution of Jews come? You don't know? Scampy and the team headed out from Lone Wolf towards the Town of Lucerne Valley. At Lucerne Valley, are cross roads. To the right is Big Bear. Straight ahead is Yucca Valley. We decided to go towards Yucca Valley. Big Bear is up in the mountains. It's cold there. Scampy is Afternoon Camped at the WalMart in the Town of Yucca Valley. Some Campbell's Clam Chowder was warmed up for lunch. 10am - When I lived in Mexico, a TelCel USB modem was all that was needed to get internet access. That service, as I recall, was unlimited and not expensive. Right now I am using a Cricket Personal Hotspot with my iPhone. 8gb/month costs $50. And 8gb is not very much data! Is there a way to use a USB modem with my Mac Air to get on the internet as I did in Mexico? I am confused about this stuff? I really should have the will-power to resist preparing cookies. Because I eat at least half a batch within a couple of hours of baking them! But K-Mart had a sale on Betty Crocker Oatmeal Cookie Mix. Only $1! What could I do? 4pm - Itunes movies no more! On the way to 24 Hour Fitness, I stopped at Best Buy where there is a WiFi available. Every time that I buy a movie from iTunes, I have big trouble getting the movie downloaded. I should have learned by now to buy movies only in DVD format. None of this awkward downloading stuff for me anymore! Had a good workout at 24 Hour! 9am - We were thinking about following the Lewis and Clark Trail for the second time later this year. But this time with Scampy. We went to our archived web pages in 2006, to refresh our memories. What we came up with, is that it may not be possible to have a fantastic 2nd exploration of The Journey of Discovery that Lewis and Clark made [link]. It may be better to cover new ground. Explore new places. 8am - I am Blogging right now, about what happened to me on Friday, February 17th. That was the day that I left Jojoba Hills early and returned to Lone Wolf. Since that time, I believe that I have been a bit lost in my direction. Out of balance and lost. I could not figure out what had happened that would cause such a thing as this to happen to me? This morning, it came to me. Apparently being at Jojoba got me to concentrate on how long it might take for me to get to the top of Jojoba's waiting list. Since then, I've been confused about what I should be doing. I stopped planning my days. And I went into a bit of funk. This morning I looked at my wall calendar for the first time since returning to Lone Wolf. Looking at that calendar made me realize what had happened to me! Apparently for me, daily planning keeps me balanced. Without that, I seem to lose my way. The way it works for me, is that at bedtime I go over stuff that I would like to do tomorrow. And write notes to myself about those things. For example, those notes to myself kept me on a schedule for going to 24 Hour Fitness every other day. When I stopped exercising, everything seemed to go downhill. I've got to be more careful. More thoughtful. I've just finished my exercise routine at 24 Hour. And brought the Mac in order to be able to Blog from here. Besides a 1/2 hour of cardio exercise, my machine routine works every muscle group. There is one muscle group for which there is no machine. This group includes the forearm and wrist. A very important muscle group because if it is not in condition, carpel tunnel pain may come calling! I use a 10lb dumb bell weight to do this exercise. 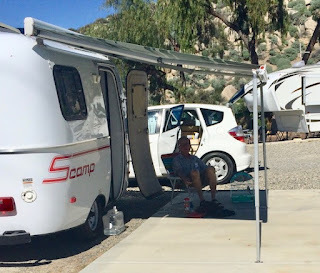 This morning when Scampy was parked in front of MsTwayler, a few other RVers walked by and commented how they were jealous of me having a tiny RV like Scampy. I asked why? The answer is, that I am able to take Scampy out on little winter camping trips. These other RVers feel sort of locked into Lone Wolf all winter. They are waiting for springtime to go camping in their large RVs. What I am doing right now, is Day Camping in the 24 Hour parking lot. I am just coming to understand the importance of this kind of camping! It gets me out and doing something. Not just being inside MsTwayler with the day passing by. 9am - We have had some heavy weather lately. But today is a bright day, filled with sun shine. We are happy about the rain. But we love the sun shine! MsTwayler in the sun shine! Since arriving back at Lone Wolf, we have not been doing much. Just resting. We have not even gone to 24 Hour Fitness to exercise yet. 8am - We did not realize until this morning, that our drive back from Jojoba yesterday could have put us right in the middle of that huge storm! We are sooooo lucky to have missed that storm by only a few hours! 8am - We've left Jojoba Hills and are heading back home to Lone Wolf. We headed out a day early. Anxious to be back with MsTwayler! This morning I phoned Bank of America about my credit card. The automated phone would NOT let me speak with a human being. Since I do not talk with machines, I guess this means "goodbye" BofA! 2pm - Back at Lone Wolf! I am sooooo happy to be back at Lone Wolf! Because I am so very tired out from the trip home! In fact, I am so tired that my eyes are blurry! It's gonna take me awhile to recover! I've collapsed into the the La-Ze-Boy. Wow! I feel sooooo much better now that I've had a nap. The inside of MsTwayler is getting warm now. And comfortable. Baby Boid's cage is door is open. But he has not emerged yet. 5:30pm - Rain and Wind! Because it is so cold and windy outside, I decided to head over to 24 Hour Fitness in order to soak in the hot tub! What better way to get warm? Right? On my return, I stopped at Stater Bros and bought a Claim Jumper Blackberry Pie! It's baking in the oven right now! Yummm! 6pm - Rain is sooooo very loud! The falling rain is so loud, to be almost overwhelming in sound. How could rain be so heavy without a flood? It is sooooo very weird! The rain continues to fall so loudly, that it is almost impossible to imagine how very loud it is! When will this damned loud rain stop? "An intense winter storm dumped some of the heaviest rains in years over Los Angeles and neighboring areas on Friday, with flash flooding widespread and landslides developing." It is obvious that weather authorities, which only hours ago reported that the drought continues, do not even have a single clue to what the actual weather conditions are at this time! But I will state, categorically, that there is no drought in California at this time! When will I get to the top of the waiting list? That's the question on Reader's minds? But! That is not the question on my mind. Because, I don't want to focus on "that particular" when! That's like focusing on the day that I'm going to die! That is plain no good! Because my focus should be on the things that I'm going to do tomorrow. Or the next day. To be excited about those days! That's my way! 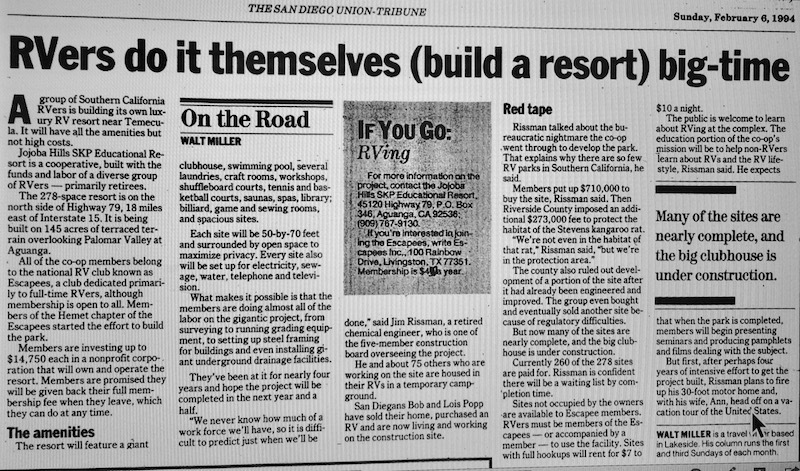 8am - I may be more fascinated about how Jojoba Hills got founded than most persons. It's the foresight, dedication and stick-to-it-ness of the founders that grabs me! We never camped in a place where Scampy's awning might be useful before. However, here in Jojoba's Boondock area is a perfect place for the awning! 3pm - My first volunteer job! Last September, during my first stay at Jojoba Hills I was soaking in one of their Jacuzzi pools. On my mind was volunteering. As you may know, volunteering is a primary thing here at Jojoba. That's how stuff gets done around here! That's when it popped into my head that I would volunteer to shine up the stainless steel tube rails that go into the Jacuzzi pools! And that thought has been rolling around in my head ever since! Yesterday at the grocery, I bought some abrasive polish cloths to do that shining up! This afternoon, I shined up that pole. Came out great!! I'm now a Jojoba volunteer. And.....I am not even a member yet! 7am - One afternoon, several weeks ago, I sat at a large round table in Friendship Hall. I was not aware on that afternoon, that I was sitting at the Founder's table. 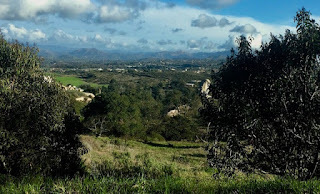 "The first time that I arrived at Jojoba Hills and viewed what would become the entrance road, there was not even a trail going up the hill." In fact, on that afternoon, I had absolutely no understanding of what it was like back on the very first day that the Founders met at Jojoba. Why was I blessed with the insight of how that first day was? I don't know the answer to that question. But I am sooooo thankful for that insight! Yesterday evening I watched a video titled "The Jojoba Hills Story." As the video began, I realized that the founders volunteered themselves to do the actual work of creating this place. Digging holes. Mixing concrete. Pounding nails. Building Jojoba for these founding persons was a labor of love and devotion. Their muscles ached with this work. After the video, I realized that it would be pretty much impossible for me to comprehend building Jojoba in the personal way that each founder experienced. And, although I will never fully comprehend. I have some tiny bit of understanding. And for that I am truly grateful! 9am - Perhaps thru the magic of natural selection, Little Honda and MsScampy found their way to Jojoba Hills. We are staying in the Boondock Area for 7-days! Note: Are you a regular Reader and have not ever heard of Jojoba Hills? If so, re-read all of our Blog posts from mid-September, 2016 forward! 6:15pm - What happened to George?! 8am - First of all, we are at the exact same Jojoba Boondock Site as the last time we stayed here. The site next to the laundry. That site was open. So I took it. We arrived here at 8am, and a very nice Jojobian lady drove down to the main gate and let us through to the Boondock area. I ate a quick breakfast and then walked over to the office and checked-in. We booked the maximum Boondock time. 7-days. But I needed cash or bank check to pay the $35 rent. I had neither! 10am - So, I drove into Temecula and withdrew cash from my credit union account. On my return to Jojoba, I did a little grocery shopping at Stater Bros [getting to be one of my favorite markets!]. We worked on fixing one of our stealth curtains. And some other stuff too. Then, drove over to Friendship Hall and the exercise room. After exercising, I soaked in the Jacuzzi and returned to Scampy for supper. 5pm - We used our NordicWare Grill to make a steak. Really love that NordicWare Grill !!! 7:30am - Late yesterday afternoon, I drove to the nearest Home Depot to my Cousin Jacky's home. 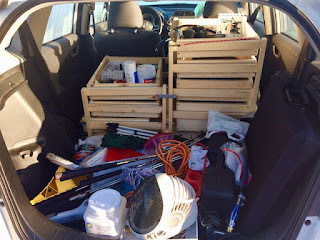 I had, at long last, determined how Little Honda's storage drawers were going to be positioned. Out in the Home Depot parking lot, the 2-sets of drawers were moved around to the best position. 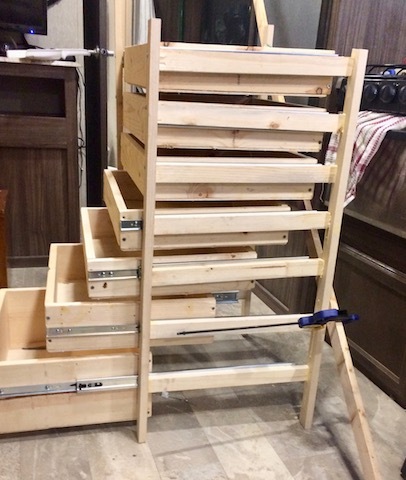 The two sets of full extension drawers, are now back-to-back. The backs bolted together in order to be sturdy. The foot of the cabinets are bolted to a 1/2" thick 2 foot x 4 foot plywood board. This 1/2" board is placed just behind Honda's driver and passenger seats. All in all, the drawer project came out well. Lucky it was to come out well too. Because my planning of these cabinets was pitiful! When I had completed the first of the two sets of 7-drawer high cabinets, I stacked them up to get a look at how they would be. Wow! The stack looked too damned tall! Grabbing a tape, I took a rough reading of the height. Right away I know something was not at all right. It was not even necessary for me to go out to Honda and measure the floor to ceiling dimension. I knew, that I had messed up! I went out and measured anyway. Goes to show! If a guy is lucky, things works out! We've made a Camp in the upper parking lot of our old 24 Hour Fitness at Grossmont. It's quiet here. May extend this to a Nite Camp. Tomorrow I have an appointment with my Kaiser primary care doctor. I need a referral from him. More about that tomorrow. 5am - My oldest and dearest friend! 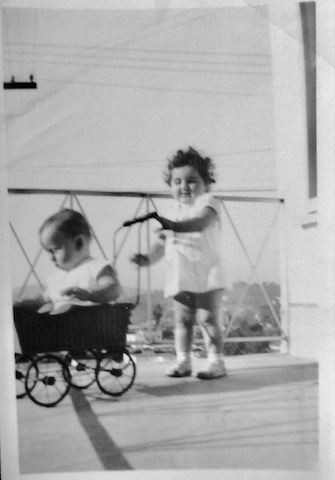 My Cousin Jacky and I lived across the street from each other when we both were babies. We are 9-months apart in our birthdays. We were both born in the same year, 1937. Jacky in February. Myself in November. We both attended City Terrace Elementary School together. In the huge field behind Jacky's home in Monterey Park CA, I hunted down my first bird with my Benjamin air rifle. We were around each other at family parties. In 2008, our long planned for trip to Israel happened. We both travelled all over Israel together. Seeing Israel. Visiting our Israeli family members. Today we will be celebrating Jacky's 80th birthday together. 9am - Tomorrow is Cousin Jacky's birthday. Little Honda, MsScampy and George are heading out her way to celebrate! Likely leave Lone Wolf around 11am this morning. We were traveling along State #138 and came to I-15. Since there was a ton of stop-and-go traffic on I-15 and George was a bit sleepy, we took this opportunity to make an Afternoon Camp! MsScampy is sooooo happy for Baby Boid and George to be in comfort because of her! There is no hurry to arrive at Cousin Jacky's. We are not expected until mañana. We headed out from Lone Wolf especially so that we would be able to camp just as we are doing right now! Isn't this Camp the greatest thing? During my nap, I was kinda dreaming about 24 Hour Fitness. You may have noticed how often on Scampy Trips that I visit a 24 Club! In fact, there hardly is any separation at all between a Scampy Trip and a 24 Club visit! A camping place in the parking lot! is now in the new cabinet! Double Wow With Sugar On It! After 24 Hour Fitness, we had to go grocery shopping for supper at a nearby Stater Bros Market. That's because Scampy's cupboard is bare! Here is our reasoning. We intentionally transfer hardly anything from Twayler to Scampy anymore, because we want to be totally self-sufficient at the very beginning of a MsScampy trip! Not one single thing needs to be remembered to transfer. We are able to be On-The-Road and Heading-Out in minutes!! Because we could not find things! For example, our Nordic Ware Reversible Grill Griddle [Link]. We bought for supper a nice thick Rib Eye Steak because we had the Nordic Ware Griddle. So.....we sorted out the whole mess for that! But we did not ACTUALLY sort anything! 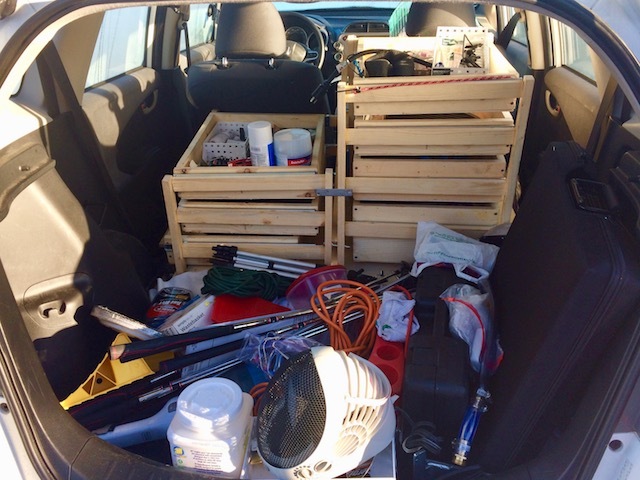 All we had to do, is get individual items from the jumbled mass of stuff on Little Honda's rear floor into ANY drawer where it would fit! Right after finishing this Blog post, comes preparing the Rib eye steak and veggies!! 9:15am - Yesterday when we unloaded MsScampy, the Mac was left behind! And when we found out about that, the Lone Wolf office was closed. MsScampy stays inside the storage yard, which is locked. I've been working all day to complete Little Honda's new storage cabinets. A little while ago, I finished! The two cabinets are now installed in Honda's storage area. I am sooooo exhausted! I am heading over to 24 Hour's spa and treat myself to a long soak so that I may recover. 6am - There are two flowers in MsScampy's tiny garden. 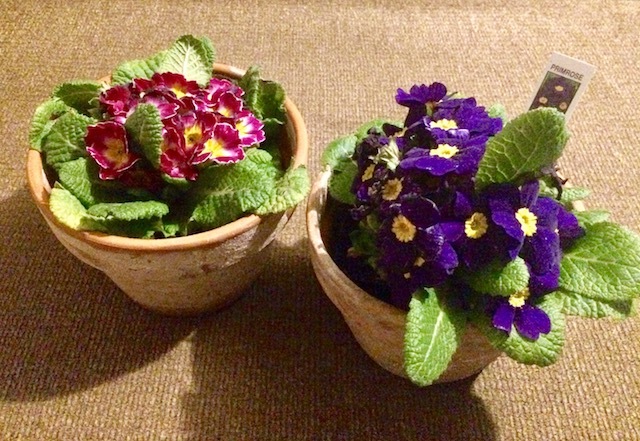 They are both PrimRoses. And MsScampy brought them on this trip for viewing and for safekeeping. This morning I'm going over to 24 Hour Fitness. I have benefitted sooooo much by going to 24 Hour regularly [every other day]. My physical condition has improved so very much. I am hardly the same person anymore! It was my cessation of using prescribed medication which led to my being able to benefit by being a 24 Hour member. Able to do common things easily. ie; Put on my shoes and pants! I have NOT been diagnosed as having had a "Brain Hemorrhage" by my doctors. I deduced that on my own from the symptoms that I had. I believe that one of my prescribed medications, caused a massive decline in my health. This medication is: Warfarin. Prescribed for me as a result of a minor blood clot which occurred after replacement of my aortic valve in March, 2014. Warfarin is a blood thinner. In my case, Warfarin caused minor bleeding of my brain which led to a major upset of my physical self. In my opinion, from my research, I conclude that my continuing to take Warfarin would very likely led to my death. Click [Here] to read about Brain Hemorrhage. When making Stealth Nite Camps, it's a good idea to leave them early next morning. That way, you are gone before being noticed. In this case, noticed by the employees who work at Les Schwab Tire Center. Baby Boid is still asleep. It would be terrible to awaken Boid at this ungodly hour! So, we tucked in Boid's cage where it sat on the corner of the bed. The wall's corner boxed Boid in on two sides. My sleeping bag and two pillows would secure Boid's cage for the short trip to Kaiser Hospital. I have an appointment in radiology at 9:15am for a Dexa Scan. Little Honda drove at a max speed of 25 mph in order not to disturb sleeping Baby Boid. We drove with our blinkers on in order to alert drivers. When traffic became heavy, we pulled over and stopped, waiting for traffic to clear. When we arrived at Kaiser, we made a Morning Camp on a residential side street very close to the hospital. 9am - Boid's first moult! The first thing done each morning, is wake up Baby Boid. Gently remove his black cage cover. And say, "Good morning, Baby Boid!" Then, Boid's seeds are changed. And his water too. Then change the paper towel at the bottom of his cage. This morning, that's when two of Boids feathers were discovered. At the bottom of his cage Wow! Boid must be in his first moult! [Link] Boid may be a bit over 4-months of age. 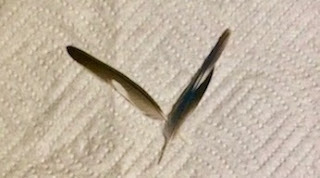 Is this proof of Boid's first moult? 11am - I got lost! After my Kaiser appointment, I did not leave the same way I entered. I guess that I must have been on the other side of this Kaiser facility. And this place is HUGE! Walking in the direction that I figured was correct, was definitely NOT correct. I was lost! Big time! So, I got out Little iPhone and phoned Uber. When the Uber guy came, I explained to him what had happened. We drove to Kaiser, and turned right. We drove back to Kaiser and turned left. Hey! This looks familiar!! A couple of blocks in this direction, and there they were! Little Honda and MsScampy! When I went inside MsScampy, I explained to Baby Boid what had happened. But Boid did not seem to be interested!! Boid just sat there on his cage perch and smiled at me! 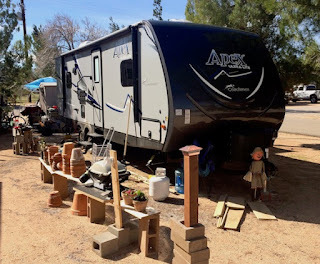 A stealth Rver is usually one who does not stay in RV parks. 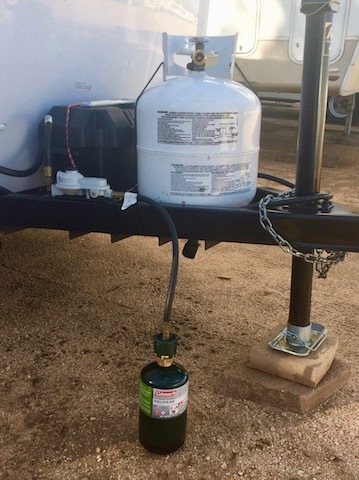 Stealth RVers must develop resourcefulness in order to fill their fresh water tanks. MsScampy's fresh water tank holds about 8-gallons. I check the tank regularly by opening the door to the dining table bench and viewing the water level. Checking this morning found about the level to be 2" from the bottom. This afternoon, at a Mobil gas station, the clerk offered to let me use a water spigot to fill Scampy's tank. 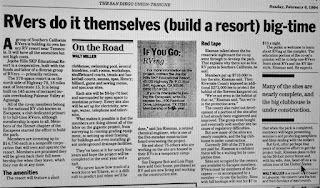 Here is a [Link] to that story! 7am - Have you read our values? [Link] Our value "Order" means that this morning, prep for The Trip includes squaring away MsTwayler. That means taking down Twayler's Cabinet Shop so that everything can be cleaned up. Another very important item, is obtaining a key for Little Honda that will be hidden. On our last trip, we came very close to getting locked out when our Honda key got mislaid. We found it! Honda's key is one of those new-fangled keys. Apple Valley has a key shop that is able to make dupes. Of course we must set-up MsScampy for this trip! We planned to leave Lone Wolf at 2pm. However, loading up Scampy took an extra 1/2 hour. About the time we were to head out, we found that something was wrong with connection to the deep cycle battery that provides Scampy electric power. We checked the main fuse on the battery. It was OK.
We checked polarity. Were the + and - connections reversed? The battery was removed for a several day charge. Could the battery upon return to Scampy had the + and - reversed? No. That was OK.
We checked the electric panel inside Scampy. The 20 amp main fuse was blown! Of course we carry a good supply of all the fuses used. Replacing the 20 amp main did the trick! As you likely know. the first thing to do on arrival at place where you plan to Nite Camp, is to find a potential Nite Camp site. Best to do a Nite Camp search before dark! We found what appeared to be good Nite Camp site, at the rear of a Les Schwab Tire Center. We stopped in the parking lot, and one if the Les Schwab people walked over to ask if we needed service? "Yes", I replied! "The trailer wheel bearings need to be lubed." He directed Honda and Scampy into one of the service bays. And the shop foreman came over to ask, "May I look inside your trailer?" Of course we answered, "YES." Because we love to show people the delights of our Scampy! 24 Hour Fitness in order to use the shampoo in one of 24's showers. to make our Nite Camp. This is a decent Nite Camp! Not too much traffic noise. Scampy's Going To Fontana Tomorrow! 10am - There is a Kaiser appointment scheduled on Friday, February 3rd for George. The appointment is located in the City of Fontana, CA. Fontana is only about one hour away [55 miles distant]. Why go a day early? Because we on the TiogaRV Team take every opportunity to make a Nite Camp! In a Team Meeting, it was moved and seconded to go one day early! So, that's that! Note: Our Team is the TiogaRV Team. We have always called it that. And always will call ourselves the TiogaRV Team. Little Scampy is our RV Camping Trailer. She understands why we do not call ourselves the ScampyRV Team. And she's OK with that. Yesterday, our headline Blog post addressed a "CNN Money"
video/editorial-opinion about predictions of how robot automation will evolve in the distant future! "NOTE: I am breaking off here, to give you a chance to express your opinion about this in comments. Then, I will continue." In that 9pm post, I showed a pic of a sign that I believed would keep me aware of when Honda was towing Scampy. I forgot twice!! Once while backing up. That time caused Scampy to jack-knife and damaged Little Honda. The 2nd lapse of being aware happened while towing Scampy and parking in front of the Lone Wolf office. When I got out of Honda, I was very surprised at Scampy being there!!! 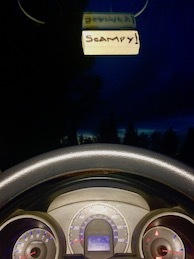 I told Readers that I had made a "Scampy warning sign." This sign would prevent me from forgetting ever again! Three Readers commented that my sign would not work! Here is the sign in place. Velcro is holding the sign to the inside of Little Honda's windshield.